Achieve a sleek, salon-worthy finish with Paul Mitchell Awapuhi Wild Ginger Mirror Smooth High Gloss Primer; a multi-tasking formula that delivers shine, moisture and thermal protection. 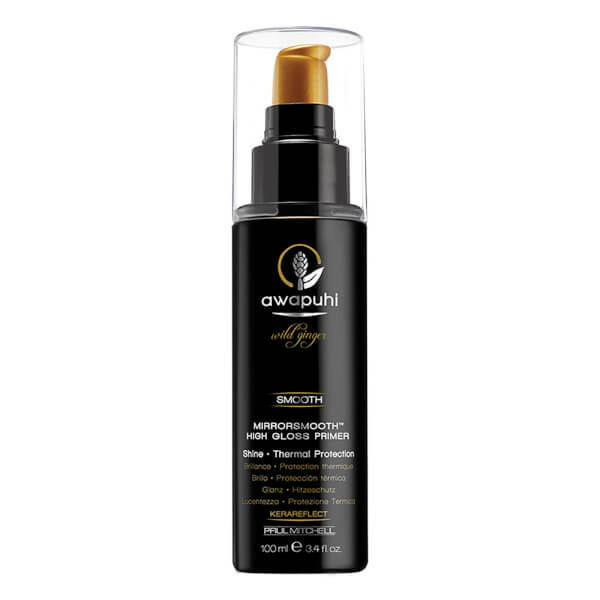 Fortified with an exclusive KeraReflect™ blend of natural Abyssinian Oil, Keratin Protein and Awapuhi Extract, the humidity-resistant primer replenishes hydration and controls unruly locks, whilst defending against frizz and shielding from the damaging effects of heat styling. Hair is left smooth and perfectly polished with a luxurious fragrance of Bergamot, Pineapple, Wild Ginger and Hibiscus Flower. Propylene Glycol, Aqua (Water, Eau), Cyclopentasiloxane, Phenyl Trimethicone, Dimethicone, Crambe Abyssinica (Abyssinian) Seed Oil, Hedychium Coronarium (White Ginger) Flower/Leaf/Stem Extract, Keratin, Hydrolyzed Keratin, Oxidized Keratin, Sodium Acrylate/Sodium Acryloyldimethyl Taurate Copolymer, Isohexadecane, Polysorbate 80, Butylene Glycol, Bisamino PEG/PPG-41/3 Aminoethyl PG-Propyl Dimethicone, PEG-12 Dimethicone, DMDM Hydantoin, Iodopropynyl Butylcarbamate, Phenoxyethanol, Alpha-Isomethyl Ionone, Parfum (Fragrance), Limonene, Hexyl Cinnamal, Benzyl Salicylate, Benzyl Benzoate, Citral, Linalool.